This letter is from a group of Jehovah's Witnesses to the County Prosecuting Attorney of Pittsburg, Kansas. The group describe being confronted by a mob of thirty to forty people who threw bricks at the Witness's place of worship, damaging the building. During World War II, persons appearing to oppose the war in some way were often subject to harassment. 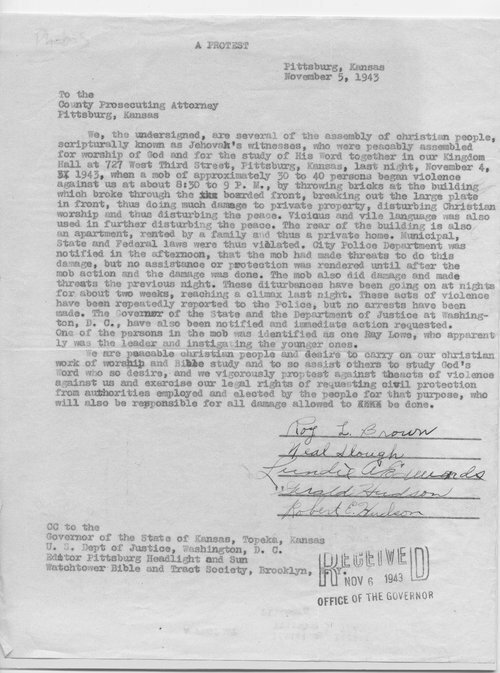 This letter can be used in conjunction with other materials to demonstrate the difficulties that Jehovah's witnesses and other conscientious objectors faced during World War II.